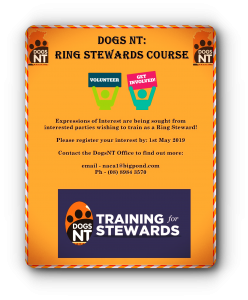 DOGSNT RING STEWARDS TRAINING COURSE. 🚩 PLEASE NOTE: THIS NOT A SHOW MANAGERS COURSE. IT IS PURELY A STEWARDS COURSE. 🚩 If you interested in stepping up to help in a Show Manager role – please contact the office with an EOI in attending the Show Managers Course. 🔶 If you answered ‘YES’ to the above: WE NEED YOU! 🔶 DogsNT is planning on holding a Steward Training as we are in URGENT need of Ring Stewards. 🔶 DogsNT will be running this as a shortened concise course.